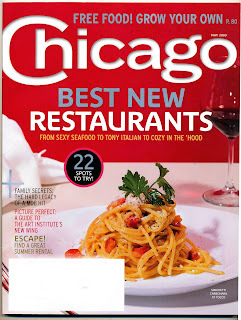 We at Kurman Communications, Inc. are proud to announce the May 2009 issue of Chicago Magazine named Glen Prairie as one of Chicago's "2009 Best New Restaurants." The magazine named 22 best new restaurants, putting the organic, locally-focused Glen Prairie alongside top names like C-House, Graham Elliot, and L20. Congratulations to Glen Prairie and chef Daniel Ovanin for this honor. Be sure to catch chef Daniel in action live this Saturday, April 18 during CBS-2's 8 a.m. news broadcast, where he'll be talking about the environmentally-conscious restaurant and shopping at local farmer's markets. Wow, yet another reason to go visit my hometown!